It always fun when artists who don’t normally work together, get together to work on a collaborative piece so I thought I’d reflect on a few of the collaborative pieces I’ve seen in London over the past year which have really caught the eye. A lot of them don’t exist any more, such is the nature of the medium but they do live on in pictures which, to be fair, is kind of the idea of a lot of street art. 1. I had to have seen and photographed the art myself. 2. 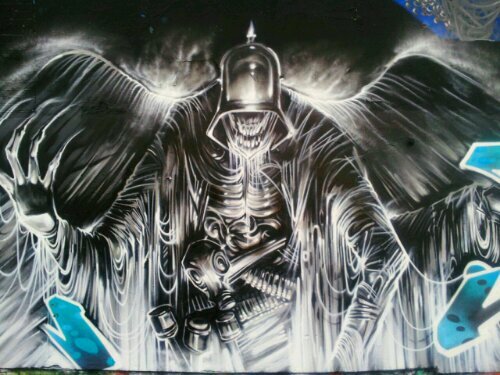 Graffiti Crews were not included, that’s probably a post for another day. 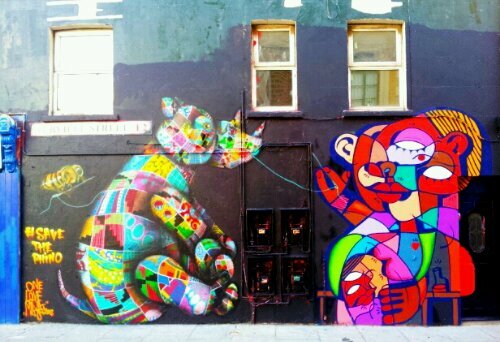 So onto the art and here at last, is the totally random Inspiring City Top 10 street art mash ups!!! 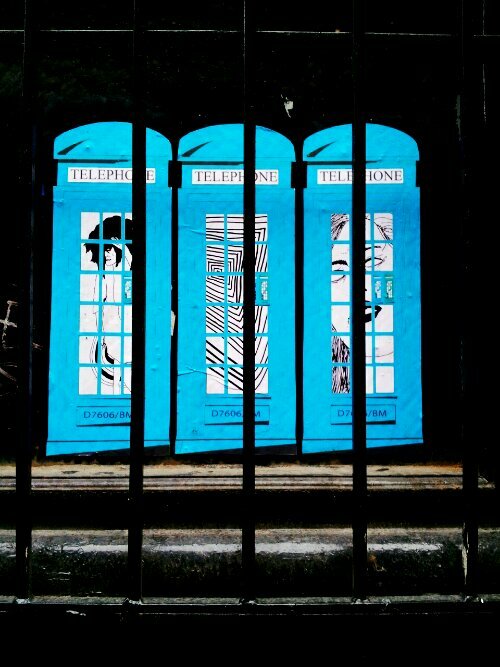 Paste up artist D7606 has become very recognisable over the past year with the sheer variety of his telephone box paste ups. He constantly reinvents these by producing different versions with different people inside. The artist is also a prolific collaborator and he has produced special editions of his work with the likes of 616, Olga Noes, Ugly House and Ben Murphy. The piece featured here is my personal favourite and is the collaboration with Murphy, produced as part of Murphy’s solo show earlier in the year at the Bear Gallery. Ben also works a lot with other artists and so it seems fitting to include this work on the list. This is a highly entertaining piece to look at and if you were to pick two artists whose work you think would not go together it’s Conor and Ronzo. 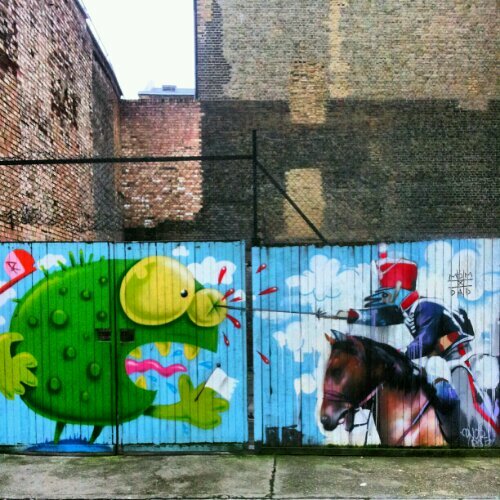 Harrington paints period figures whilst Ronzo is best known for his cartoon art and his fun looking monsters. In this piece on Fashion Street (which has been there a while) the two combine in a surreal way. 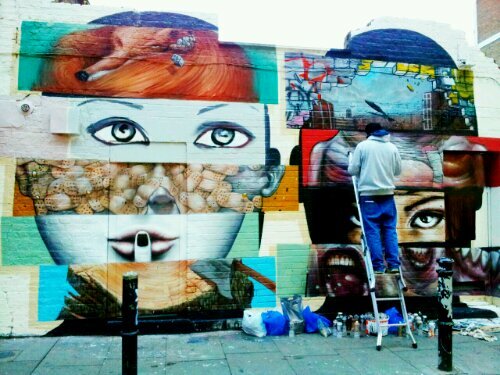 These two artists came over from France with the sole purpose of painting this mural on Hanbury Street close to Brick Lane. 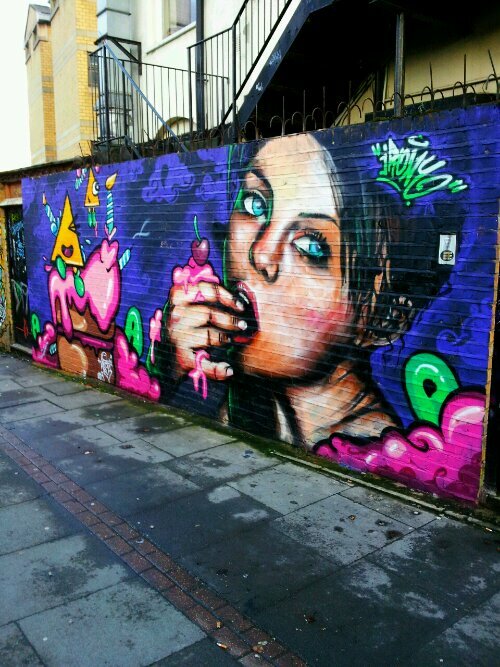 It’s a prime spot which had recently boasted works from Ben Slow and Mear One. The piece is intricate and detailed and the quality is excellent it’s now been replaced with another excellent mural but it had a good innings and lives on in this top 10. Artista has a whole host of fun characters to draw upon and she uses them to good effect whilst working together with other artists which have in the past included the likes of Irony, Deco and Amara Por Dios. Bint has a really similar style and her snooty chickens are everywhere and a treat to see although her work can most often be seen in the Leake Street Tunnel. It must have made total sense then to pair up and paint their chicken and egg piece on Club Row in the heart of Cool Shoreditch. 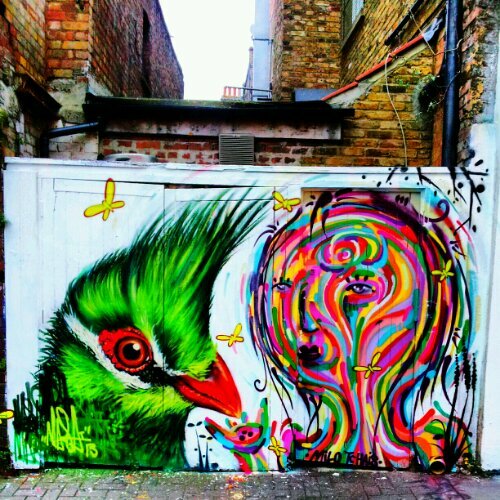 Also on Hanbury Street Masai and Tchais produced a colourful treat in their very recognisable styles. Louis Masai paints wildlife in amazing detail and the results are spectacular. Milo Tchais has a style which the viewer can do nothing but engage with thanks to his use of bright colours and the way he draws lines and patterns. Sadly this piece is no longer there, replaced with an admittedly excellent DALeast piece but it lives on here. These two do seem to work together quite a lot but don’t really have styles which you think would think gel too much. We’ve already seen Artista’s fun loving work whilst Irony seems to be more of a fine artist producing some beautiful portraits. Working together though they blend seemlessly and this piece on Pedley Street is just one of many collaborations from the both of them which could have been entered into this list. 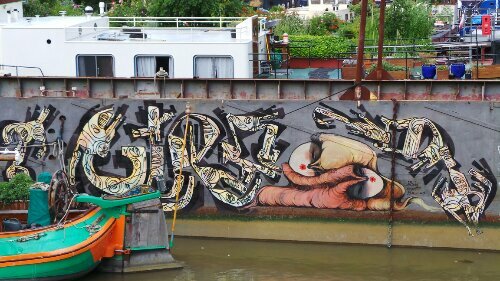 One of the most exciting projects of the year saw the hull of a boat on the River Thames painted by a number of street artists. The art was painted at low tide with the idea that it was also meant to be seen at high tide. Organised by Propa Stuff the hull can be seen from Bermondsey Wall West on the south bank of the Thames and from St. Saviours Dock. It really adds to the environment and nestles in amongst a number of other boats which are moored in the area and which are also known locally as the ‘garden barges’. The most recent piece on the list. 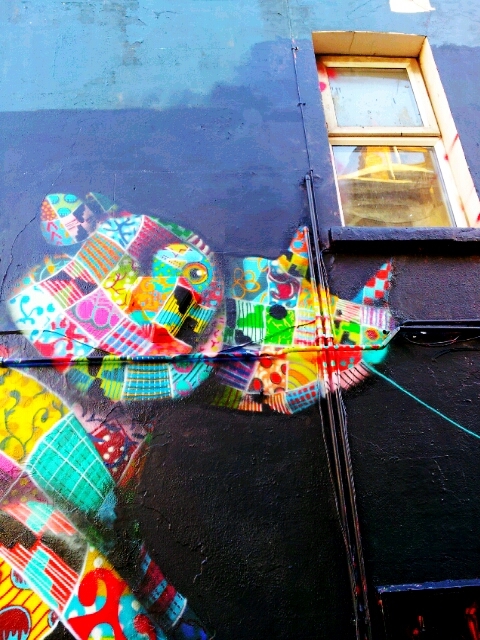 An intricately detailed patchwork Rhino from Louis Masai sewn up by a bee and one of Hunto’s colourful characters. 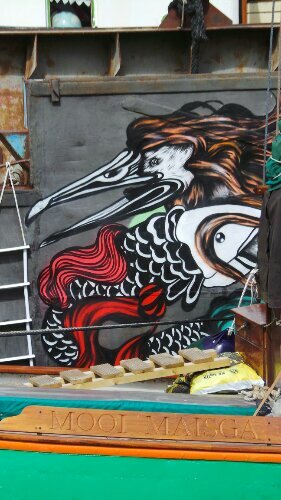 It appeared on Turville Street as part of a spate of works from both artists and is a delightful collaboration. Masai in particular uses his work to raise awareness of causes close to his heart and the Bee and the Rhino are both experiencing decline. Hunto has a unique style and is well known in the East End for his own patchwork creations. Alas it didn’t last long before it was bombed and as a result was painted over within a few days. Such a shame, this piece deserved better. I remember being quite blown away with this when I first saw it. It’s such a dynamic piece! But then Kitchener doesn’t really do things by halves and creates some incredible images with this ghoul type figure one of the most dramatic. Noir contributes the blue lettering which really adds to the impact of this painting. 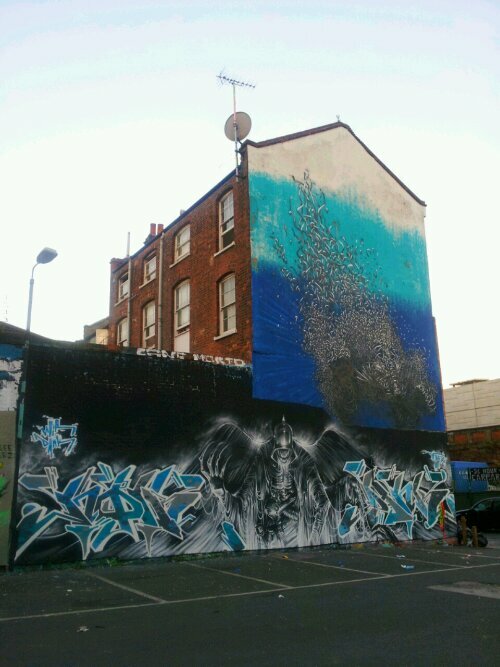 Set on the wall of the Scaler Street car park it’s further enhanced by the DALeast drawing just above it with it’s own hues of blue. Because of the location it’s unlikely to survive long but blimey it’s good. 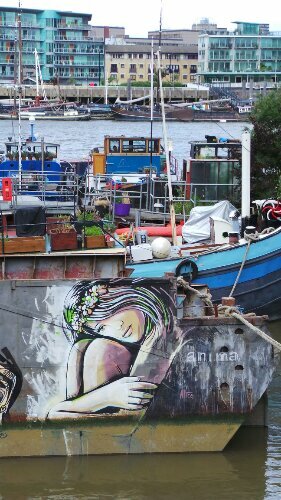 I have featured this one on a number of various posts over the past few months but with good reason, it is without doubt one of my favourite pieces of Street Art though sadly no longer there. 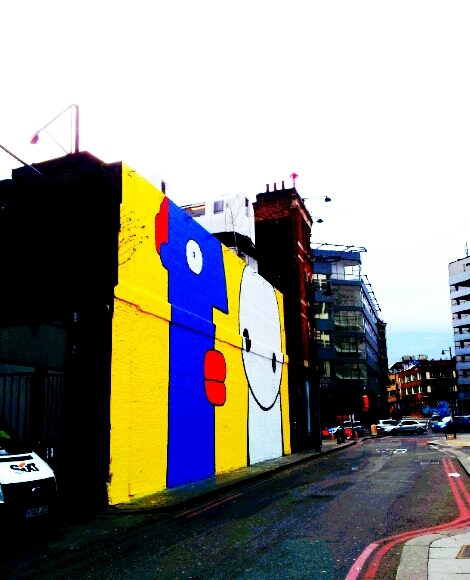 The Village Underground wall on which it was painted is operated by Street Art London and is one of the premier spots in the city attracting the very best artists to paint there. 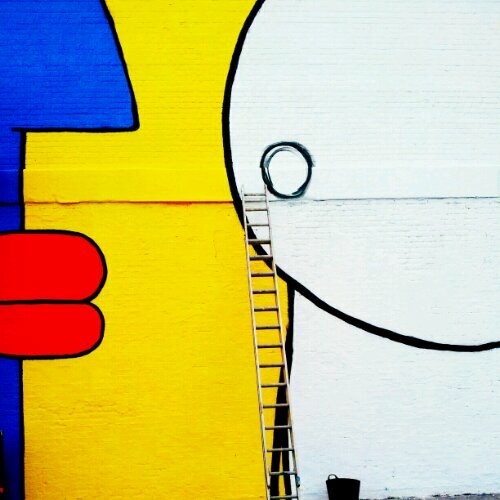 Stik and Thierry Noir have uniques styles but both essentially paint people and both love the use of bright vibrant colours. Getting these two together was a master stroke as their styles were always going to gel beautifully a worthy number one for my list. So there you are, controversial for some I’m sure you’ll agree and I’ve only included the art that I’ve actually seen and photographed myself, there are a number of collaborations that I know have happened but I just haven’t seen personally (remember my rules). So let me know what you think of the top 10, have I got them in the right order or is there a piece that I should have spotted and haven’t included? Loved that Stik and Thieery Noir wall, one of my favourite VU walls too. Cool mash!!! Must get down to see the boats… Your Scaler Street car park reminds me that just round the corner is “The Vintage Cafe” in Bacon Street, another great quirky cafe close to soooooo much street art! Do check out the loo downstairs among the vintage frocks!!! I Really Love this Post !! these are the unique Designs I gain huge knowledge from this thanks for sharing this with us.